FRESH from a crushing win over Conor McGregor, Khabib Nurmagomedov has called out undefeated boxing legend Floyd Mayweather. 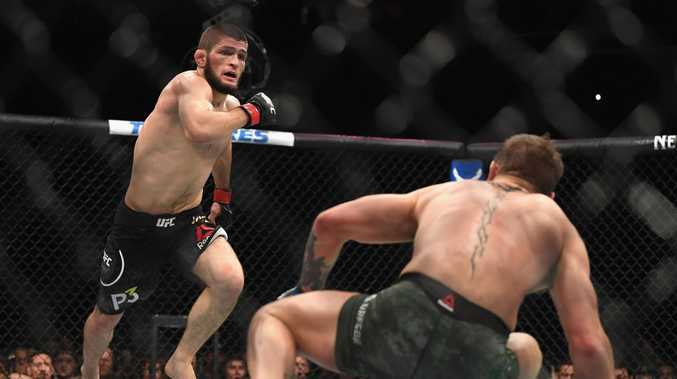 The 30-year-old Russian retained his UFC lightweight title after forcing McGregor to tap out last week - and is now hoping to emulate the Irishman by taking on Mayweather. Nurmagomedov extended his perfect record in MMA to 27-0, and urged unbeaten Mayweather to fight him to prove who is the one king in the jungle. McGregor suffered a 10th round stoppage defeat against the 50-0 boxing champ, where he was outboxed for the whole fight, and failed to land any shots of note. Nurmagomedov was in Ekaterinburg, Russia, on the weekend to watch some fights and numped into Mayweather Promotions CEO Leonard Ellerbe, who was in attendance to support undefeated American Andrew Tabiti. Ellerbe took advantage of the unplanned meeting by filming a short video with the UFC star. "Hey let's go Floyd, we have to fight now," Nurmagomedov said. "50-0 versus 27-0, two guys that never lose. Let's go, why not. Because in the jungle (there can be) only one king." Asked who was the king, Nurmagomedov responded: "Of course I am the king. Because he (Mayweather) cannot drop McGregor but I drop him easily." To which a delighted Ellerbe said: "You'll get some of that work baby." "It's going to be a huge fine I'm pretty sure because with my fight against Zab Judah, there was a crazy melee in the ring and a huge penalty - a huge fine. If I'm not mistaken, seven figures. "Not to me, but could have been to Zab Judah or my uncle Roger or even Leonard Ellerbe, so I know when a guy's jumping out of the cage into the audience and fighting different people, the fine is going to be crazy."